The 'prebiotic diet' is based on research carried out within the Translational Nutrition Science unit at Monash University. This unit has developed the laboratory-based techniques needed to quantify the prebiotic content of different foods. 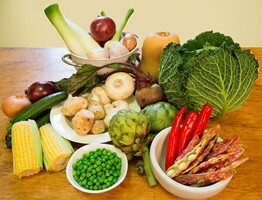 Monash University therefore has an extensive database of high prebiotic foods. Trish Veitch (Masters student and qualified chef) who works in the Translational Nutrition Science unit, has helped to 'translate' this information into delicious recipes that we hope will assist and encourage people to include more high fibre, high prebiotic foods in their diet. The recipes listed below were used in the ABC Catalyst show "Gut Reaction", broadcast 14 and 21 August 2014. The recipes can be easily modified to be vegetarian. They are also quick and easy to prepare at home, using readily available ingredients. Dishes may be accompanied by side dishes such as vegetables and salads. See also Menu Planning for further recipes and some delicious and nutritious meal ideas!